Personal Support Workers (PSW’s) manage and assist with daily tasks for people who are suffering from advanced age, illness, or injury. PSW's are unregulated health care providers. This means that there is currently no governing body that sets standards for the skills and knowledge needed to provide care. Therefore, PSW’s have varying skills, knowledge, and supervision. At Simcoe Senior Services, we ensure that our PSW’s have the training, knowledge, skills, and experience to provide high-quality and consistent care. PSW’s may also be called Health Care Aides. If working in a facility, PSW’s may also may be called Patient Care Aides, Resident Care Aides, Nursing Attendants or a Hospital Attendants. In Ontario there is a large population of seniors. Most family members work outside the home. Therefore, it is often a challenge for family members to provide full-time care to their elderly family members. Frequently families have to rely on personal support workers to provide home-based health care for their senior, ill, or injured family members. Simcoe Senior Services require that all personal support workers in our agency provide a high level of personalized care to our clients. 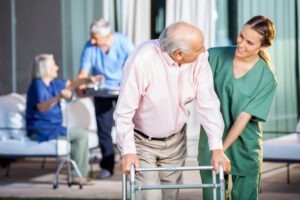 They achieve their Personal Support Worker certificate from accredited colleges and many have higher certificates, diplomas, or degrees in nursing or occupational therapy. Our experienced PSW’s are invaluable to the care of your senior, ill, or injured family member. · When requested, changing lightbulbs and smoke detector batteries, and discussing home safety hazards including rugs, hot water temperatures, improper door locks, etc. Our in-home based PSW’s provide one-on-one care to seniors, ill, or injured persons. The combination of knowledgeable and skilled Personal Support Workers with one-on-one care will provide seniors, injured, or ill persons with the best possible at-home care solution. Is a Personal Support Worker right for you or your loved one? Call Simcoe Senior Services at 705-719-9000 for a free, no obligation consultation today.